ASUS has started to sell its new entry-level convertible laptop, based on an Intel 7th generation Core m3 processor (Kaby Lake-Y) SoC. Convertable in this case means the rotation of the hinge, allowing the notebook to 'convert' into a tablet. The combination of a relatively affordable price point ($549) with a very energy-efficient Core-based processor has a potential to make the VivoBook Flip 14 TP401 popular among customers with budget constraints seeking for a hybrid mobile PC. Convertibles are believed to be a growing category, on the otherwise declining PC market, because many people want to use their devices both as laptops and as tablets. Historically, large computer suppliers positioned convertibles as higher-end machines worth a premium and charged accordingly. Last year Intel proposed to use its low-cost/low-power Atom platform for convertibles to make them cheaper but without compromising battery life. Since then, a number of companies have introduced appropriate products to address the entry-level segment of the market. At the same time, PC makers are trying to lower costs of convertibles based on Intel’s high-performance Core microarchitecture to address the mainstream segment and traditional customers who buy $500 - $700 PCs. Earlier this year Acer introduced its Switch 3 detachable machine based on a Kaby Lake Celeron SoCs, and that device started at $399. Now, ASUS has started to sell its VivoBook Flip 14 TP401 that features a higher-performance SoC, but serves the same purpose: introduces Intel’s high-performance microarchitecture to an inexpensive convertible laptop. The ASUS VivoBook Flip TP401 is 14” hybrid notebook based on Intel’s Core m3-7Y30 SoC with up to 4.5 W TDP. The model in question (TP401CA-DHM6T) is equipped with 4 GB of LPDDR3 memory as well as a 128 GB eMMC storage solution. For connectivity, the convertible uses an 802.11ac Wi-Fi + BT 4.1 wireless module, has one USB 3.0 Type-C port, one Micro USB 2.0 port, a micro-HDMI display output, a 3.5mm TRRS audio jack, an SDXC card reader and so on. Unlike many entry-level systems, the ASUS VivoBook Flip TP401 comes in an enclosure made of an aluminum alloy that gives a feel of a premium product. This premium feeling is somewhat spoiled by the screen resolution (1366×768 pixels) that seems to be low by modern standards, but it does have wide viewing angles suggesting this is a reasonable panel (i.e. not TN). The 360° multi-gear hinges are made of stainless steel and can handle 20,000 open-and-close cycles, according to the manufacturer. 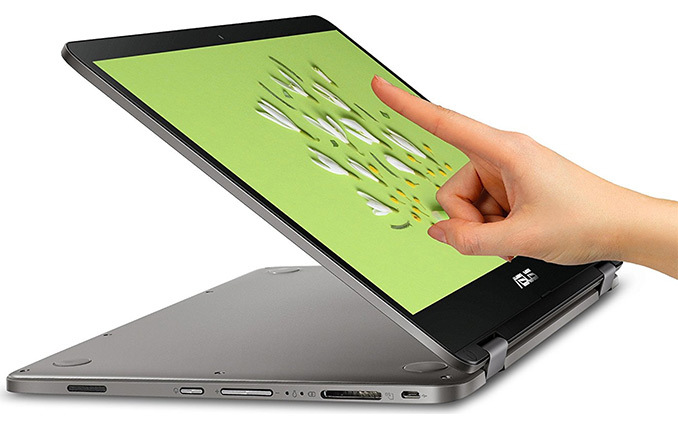 The hinges support notebook mode, tablet mode, 'tent' mode, and an 'entertainment' mode. As for physical dimensions and weight, the VivoBook Flip TP401 is 15.4 mm thick and weighs around 1.5 kilograms, which is slightly thicker and heavier when compared to higher-end laptops, but is good enough considering the price of this convertible and its screen size. For some reason, ASUS does not specify for how long the unit can work on one battery charge, but only says that the TP401CA-DHM6T comes with a 39 Wh accumulator and "lasts for a day". 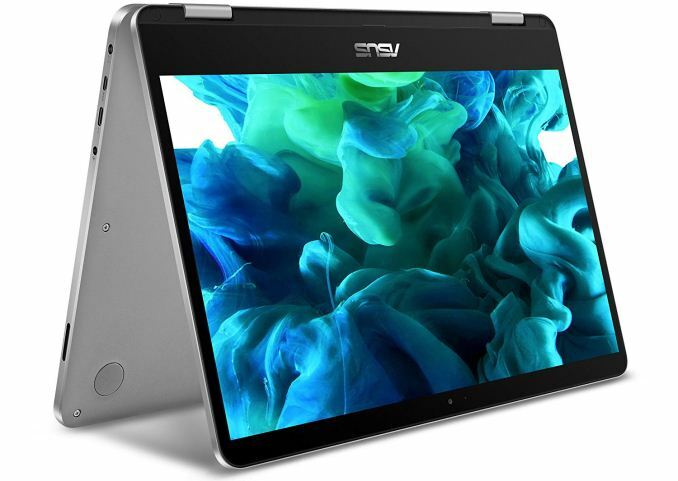 Dimensions Width 327.4 mm / 12.89"
Depth 226.5 mm / 8.92"
Height 15.4 mm / 0.61"
The ASUS VivoBook Flip 14 TP401CA-DHM6T is available immediately for $549 directly from ASUS as well as from retailers like Amazon. By now, machines such as this, should really be £260 as entry level models. 4Gb ram? 1366x768? eMMC? Come on it's not even close to being worth $549. Big difference is that they are complete fanless - I am typing this on Intel compute stick with previous generation 6y30. You can get a Pentium and Celeron chips for cheaper price - but they are dog slow - about the same older Core 2 2.2 Ghz in my option.. Significantly slower than core m chips - Intel didn't discontinue Atom - they just place then in different markets - Celerons and Pentiums for low end in laptops and there is also a 16 core Server variant. "This is not an Atom machine, it has a performance close to older generation i5"
it is only 1 Ghz when idle, in turbo mode it goes to 2.6ghz - a lot depends on if it is on battery or power. But still nothing like Atom. But the Y process I have that is like older i5 chip is actual i7-7y75 which is Dell XPS 13 2in1 - Dell work with Intel to over clock it more often bring the speed up to i5. It's the same effective pixel density as a 15.6" 1080p screen running at 125% magnification (coincidentally, I'm typing this remark on just such a screen).